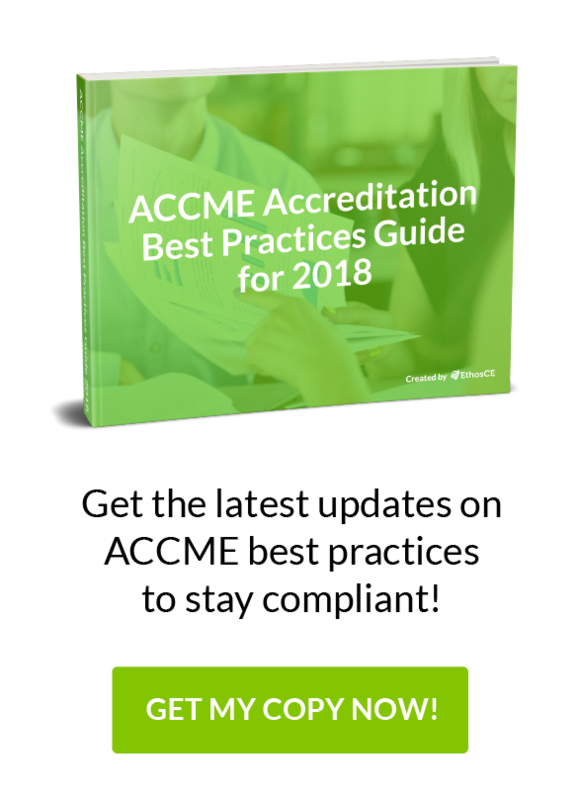 Earning Accreditation with Commendation requires CME providers to meet numerous standards in addition to those mandated for normal ACCME accreditation. In this post, we’ll present an overview of the application process along with a complete list of the criterion ACCME will use in making their commendation awards decisions. Please check with your Recognized Accreditor about your timeline for receiving accreditation materials about demonstrating compliance with the new commendation criteria. There is no change to requirements for Joint Accreditation for Interprofessional Continuing Education™. To be eligible for Accreditation with Commendation using this new menu, CME providers give evidence of compliance with any seven criteria of their choice, from any category—plus one criterion from the Achieves Outcomes category—for a total of eight criteria. ACCME has designated there will be a transition phase during which accredited providers seeking Accreditation with Commendation can demonstrate compliance with either Option A: Commendation Criteria (C16-22) or Option B: Menu of New Commendation Criteria (C23-C38). Providers can only select Option A or Option B. They are not allowed to combine criteria from the two options. Providers who will receive accreditation decisions between November 2017 and November 2019 will have the choice of using either Option A: Commendation Criteria (C16-C22) or Option B: Menu of New Commendation Criteria (C23-C38) to seek Accreditation with Commendation. Providers who will receive accreditation decisions after November 2019 must use Option B to seek Accreditation with Commendation. Providers who have chosen Option B, but can only demonstrate compliance for part of their accreditation term can still apply. They will, however, still need to meet compliance standards listed in the criteria. Attestations: You will need to attest to meeting the criterion in 10% of activities during the accreditation term. Submitting evidence for review: You must submit evidence to show how the criterion was met. The number of activities you are required to provide documentation for is based on the number of activities reported during the accreditation term. It is possible to meet multiple criteria with one activity. Examples and descriptions: For the program-based criteria, providers must demonstrate compliance with examples or descriptions as part of the Self-Study Report. Now let’s look at the key criterion the ACCME will use to make their decision. Criterion 16 The provider operates in a manner that integrates CME into the process for improving professional practice. Criterion 17 The provider uses non-education strategies to enhance change as an adjunct to its activities/educational interventions (e.g., reminders, patient feedback). Criterion 18 The provider identifies factors outside the provider’s control that impact patient outcomes. Criterion 19 The provider implements educational strategies to remove, overcome or address barriers to physician change. Criterion 20 The provider creates connections with other stakeholders through collaboration and cooperation. Criterion 21 The provider participates within an institutional or system framework for quality improvement. Criterion 22 The provider is positioned to influence the scope and content of activities/educational interventions. Criterion 23 Members of interprofessional teams are engaged in the planning and delivery of interprofessional continuing education (IPCE). Criterion 24 Patient/public representatives are engaged in the planning and delivery of CME. Criterion 25 Students of the health professions are engaged in the planning and delivery of CME. Criterion 26 The provider advances the use of health and practice data for healthcare improvement. Criterion 27 The provider addresses factors beyond clinical care that effect the health of populations. Criterion 28 The provider collaborates with other organizations to more effectively address population health issues. Criterion 29 The provider designs CME to optimize communication skills of learners. Criterion 30 The provider designs CME to optimize technical and procedural skills of learners. Criterion 31 The provider creates individualized learning plans for learners. Criterion 32 The provider uses support strategies to enhance change as an adjunct to its CME. Criterion 33 The provider engages in CME research and scholarship. Criterion 34 The provider supports the continuous professional development of its CME team. Criterion 35 The provider demonstrates creativity and innovation in the evolution of its CME program. Criterion 36 The provider demonstrates improvement in the performance of learners. Criterion 37 The provider demonstrates healthcare quality improvement. Criterion 38 The provider demonstrates the impact of the CME program on patients or their communities. If you find yourself thinking a flawless execution of all of the standards above is impossible, you’re right. Obviously, ACCME won’t expect perfection. What it does expect is evidence of your creativity, commitment to addressing the professional practice gaps of your learners, and an ability to create a positive impact on healthcare quality through your CME offerings. You’ll also need to show your association doesn’t work in a silo. The ACCME wants to see evidence your association actively pursues meaningful relationships with stakeholders in order to improve upon your CME program’s reach and impact. While you must meet all of the standards above to earn Accreditation with Commendation status, failure to reach a few of the goals presented in your Self-Study Report won’t destroy your chances. At EthosCE, we understand the challenges of seeking excellence in CME programming. We provide an enterprise-class LMS and CME management services that help medical associations of every size win Accreditation with Commendation status. Connect with us to find out how we can work together to achieve your goals.